Hide ‘n Seek Event Now Over! Thank you to everyone who participated in today’s 2018 Hide ‘n Seek Event! If you participated in the event, join Summit and use the command /kit participation. This kit will only be available until December 22nd 2018 8pm UTC. Special thank you to the seekers and winners, who can receive their respective prizes by messaging staff. Happy Holidays! This years Christmas event is hide and seek, just like last time but with a new and bigger map so all of us can play it together! There will be multiple seekers this year because of the size of the map. Just like last time we would really appreciate it if you signed up on the forums: https://bit.ly/2Gagy6L This is so we can estimate how many people will be there. If you would like to be a seeker make sure to mention it in your forum reply. The event will take place on Saturday December 15th 8PM UTC. We’re sorry about the event issues, we had over 70 people trying to participate in it at once and some issues were uncovered after the event started. We’ve fixed the problems and will run it again tomorrow at the same time. For the people who couldn’t participate here is a small warning. This event mainly consists of Halloween themed parkour and mazes so be aware of that when joining. I expect less people will join for the re-run of this event but I hope the people that will join us can enjoy it along with us. This event was a good way of finding out how large our community is we’ve learned from it and will build event with that in mind from here on out. It’s a bit late, but here it is anyways! The Halloween event consists of multiple rooms that players must find their way through. In these rooms, players must complete challenges which range from parkour to finding buttons to open doors. The event will take place Saturday, November 3rd, 8 PM UTC. Everyone is welcome to join, but it would be very helpful if participants could let us know that they’ll be joining by going to this link: http://bit.ly/2P0DGbS. This is so we know how many people to expect. 1.13.1 Treasure Hunt – Our Biggest Event Ever! Hello everyone! As you may have heard, there’s been a 1.13(.1) event in the works for quite some time now. With the server release hopefully only a few days away, it is finally time to announce the event: a server-wide underwater treasure hunt that spans the entire 18K by 18K world! Hidden throughout the entire world are roughly 5,000 little chests, like the one shown above, each one with some loot inside and an Event Tag. 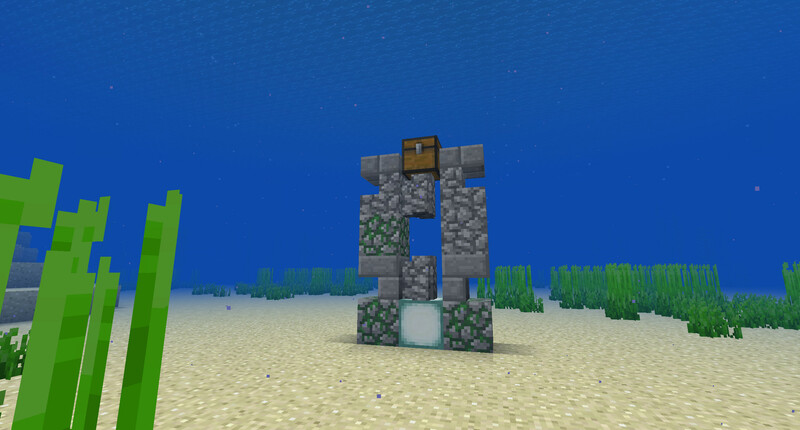 You can find these chests anywhere there is naturally water: oceans, rivers, lakes, swamps, and more. Your goal is to collect as many of these Event Tags as you can. Scattered throughout these chests is also 100 complete sets of Atlantean Tools/Armor. Each part of the set is a custom-named enchanted item. You will have two weeks, starting the day the server is released, to find as many of these chests as you can! At the end of the two weeks we will collect all of the event tags and the three players to find the most Event Tags will win a special prize. Good luck everyone, and I hope you all enjoy the event as much as we’ve enjoyed setting it up! Happy Spring everyone! I hope you’ve all been doing wonderfully this March and are excited for 1.13! For March, we are going to be hosting a 1v1 PvP event on Altitude. It will be taking place on Saturday, March 31st at 3pm EST. The event will be taking place in a separate world, so there’s no way to prepare with your own gear or bring anything into the event. Everyone will have the same gear. There will be an area for spectating, and even if you don’t PvP regularly, it would still be fun to watch or just try your hand at it for fun. Hope to see you there! You must sign up to participate! To sign up, visit the pier in spawn (stone brick walkway going around the water) and find the events board!